S&P 500 - The SPYs are consolidating right at the important $280 level. This level is important because it was the top in February, March, and mid-June. Technology - The XLKs are testing support around the $72.50 level, which was where the recent highs were in early June. If they head lower the $71 level should provide some support because it was the bottom of the range in June and an all-time high in March. Financials - The XLFs have been consolidating around the $27.50 level. They are right in the middle of the range that they have been in since March. Healthcare - The XLVs broke resistance at the $86.50 level on July 10th and they have been consolidating just above it since then. There is support there because it was the top in February and March. Consumer Discretionary - The XLYs are consolidating around all-time highs after breaking their recent uptrend. Industrials - The XLIs continue to trends upwards after rallying off of the $71 level. 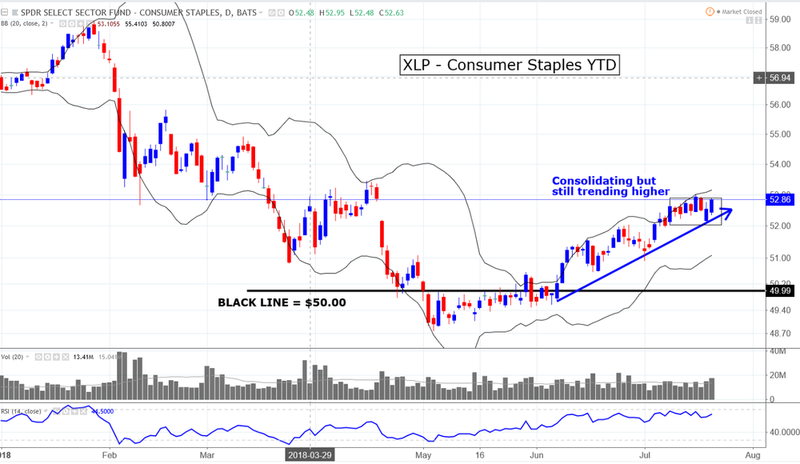 Consumer Staples - The XLPs continue to trend higher after breaking back above the important $50 level. This level was the low in 2016, and the top of the range throughout 2015. Energy - The XLEs failed at $78 after becoming overbought in mid-May. This is the same level that they found resistance at in January. The recent lows have been at $74. Materials - The XLBs trended lower after breaking support at the $60 level. There was support there because it was the top in April and May. They are now consolidating just above the $58 level. This level was the low last month. Utilities - The XLUs are consolidating around the $52 level after breaking their recent uptrend. This level was the high in April. S&P 500 – The SPYs are consolidating right at the important $280 level. This level is important because it was the top in February, March, and mid-June. The next few days will be very interesting and could be indicative of what the next few weeks will bring. If this level doesn’t hold we could see a meaningful selloff. If it does hold they will be building support at this level and it could be a sign that we are going to see another leg up in the rally. Remember that markets go up slower than they go down so I think that slow consolidation is a Bullish signal but if we have a selloff it will happen quickly. If they head higher there should be some minor resistance around $286 because that was the all-time high in January. If they head lower there should be support around the $268 level because that is where the two most recent lows were. Technology – The XLKs are testing support around the $72.50 level, which was where the recent highs were in early June. If they head lower the $71 level should provide some support because it was the bottom of the range in June and an all-time high in March. This sector is 28% of the S&P 500 makeup. Financials – The XLFs are consolidating around $27.50 after becoming overbought. They are in the middle of the range that they have been in since March. If they head lower there should probably be support again around the $26.80 level. If they rally there will probably be resistance again around the $28.35 level because it is where the recent highs have been since March. This sector is 14% of the S&P 500 makeup. 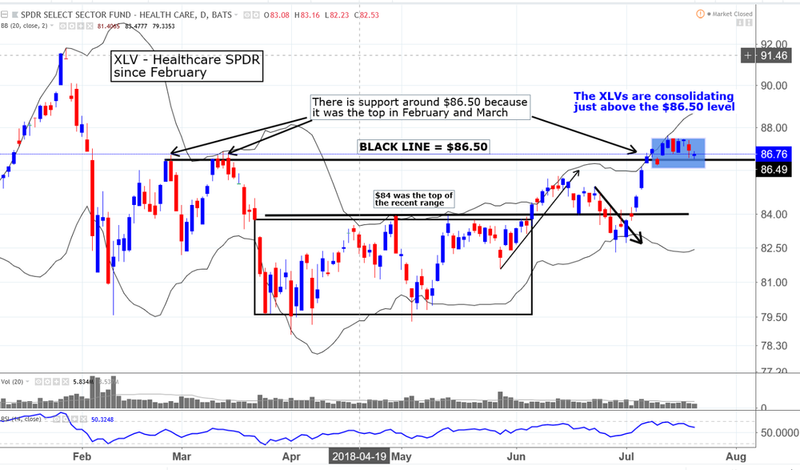 Healthcare – The XLVs broke resistance at the $86.50 level on July 10th and they have been consolidating just above it since then. There is support there because it was the top in February and March. This sector is 14% of the S&P 500. 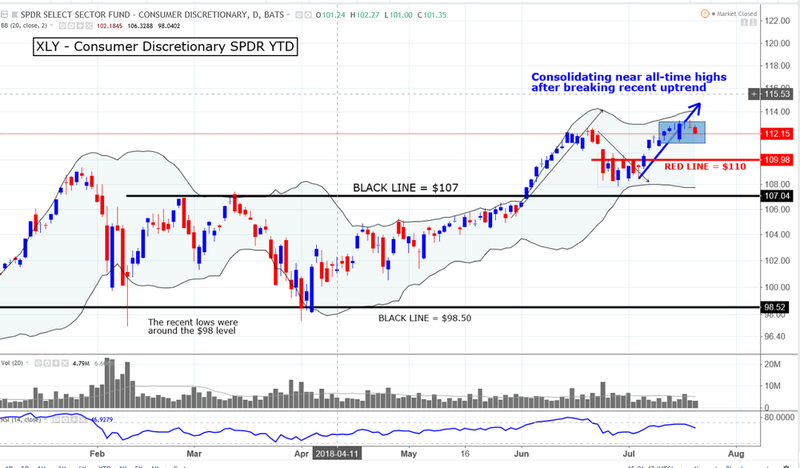 Consumer Discretionary – The XLYs are consolidating around all-time highs after breaking their recent uptrend. If they head lower there will probably be some support around the $110 level because it was the top of the range at the end of June / early July. Longer-term there will probably support around the $107 level because it was the top in February and March. This sector is 13% of the S&P 500. 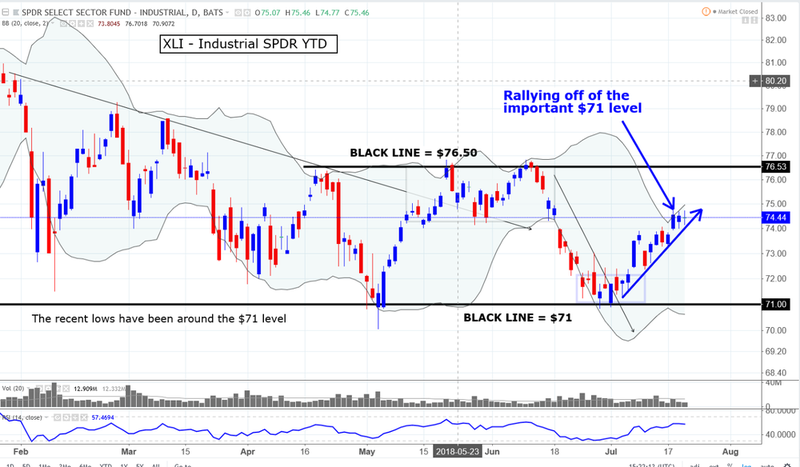 Industrials – The XLIs are rallying off of the important $71 level after consolidating for a few weeks. There was support there because the recent lows in November, February, and early May were around the $71 level. If they continue to rally they will probably run into resistance around the $76.50 level. That is where the three most recent highs were. $71 is an important level so if it breaks there could be a meaningful move lower. This sector is 10% of the S&P 500. Consumer Staples – The XLPs have been trending higher since breaking back above the $50 level. The $50 level is important because it was the low in 2016, and the top of the range throughout 2015. It was also the top throughout May and early June. This sector is 7% of the S&P 500. Energy - The XLEs failed at $78 after becoming overbought in mid-May and more recently on July 10th. This is the same level that they found resistance at in January. They also hit resistance and rolled over at this level in December of 2016. They have been consolidating just above support around $74. There is support here because it the top in late April. 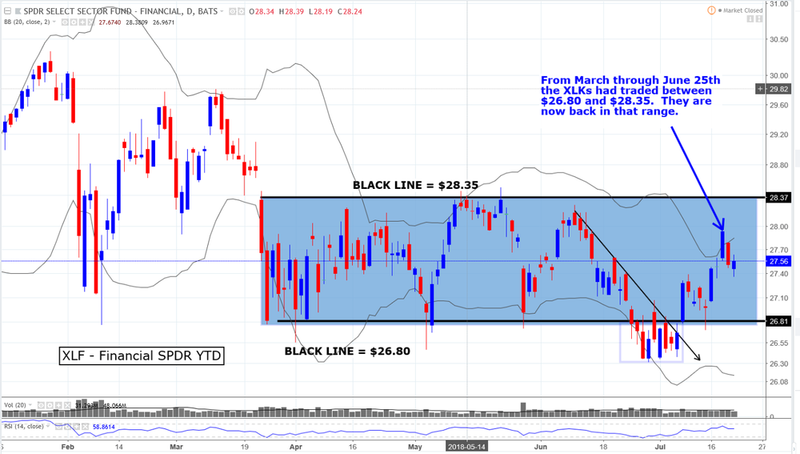 If they break this support there could be a meaningful selloff because there are no clear levels of support until they approach the $68.50 level, which was the top of the range from mid-February through early April. This sector is 6% of the S&P 500. Materials - The XLBs are consolidating just above the $58 level. This is where they found a low last month and where they traded from the end of June through early July. This sector is 3% of the S&P 500. 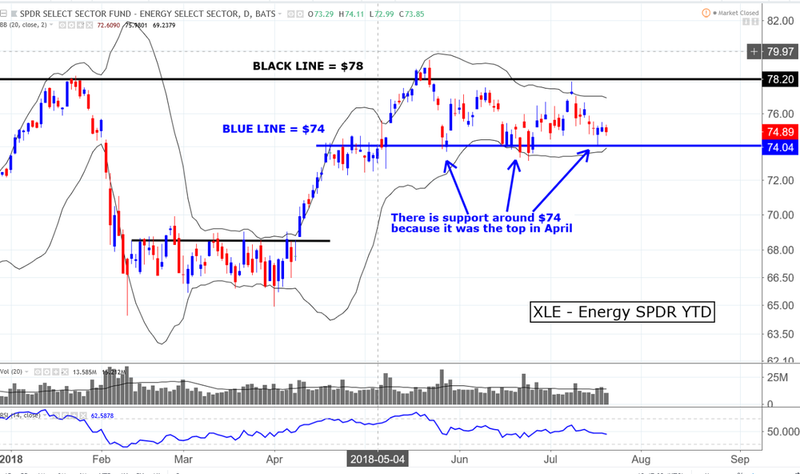 Utilities – The XLUs are consolidating just above the $52 level after breaking their recent uptrend. The $52 level was the top in April. If they head lower longer-term, there will probably be support around the $49 level because it was the bottom of the range from February through June. This sector is 3% of the S&P 500.